While the Nissan Versa Note is being discontinued after the 2019 model year amid slow sales, its sedan sibling lives on for a new generation, despite other automakers abandoning the segment. Unveiled at the Rock the Ocean’s Tortuga Music Festival, the all-new 2020 Nissan Versa has arrived with a fresh new design and an abundance of tech and safety features not usually found in the subcompact segment. "As other nameplates exit the field, we see a real opportunity to build our segment-leading market share and nurture this crucial group of new-car buyers. More importantly, the new dramatic Nissan Versa design and jam-packed list of features will ensure that customers feel confident they made no compromises in that first purchase,” said Claudia Marquez, vice president of sales operations, Nissan North America. Aesthetically, the new Versa’s exterior is lower, wider and longer than its predecessor. It also borrows elements from Nissan’s "Emotional Geometry” design language introduced in the flagship Maxima and all-new Altima such as the V-motion grille, boomerang-shaped headlamps and tail lamps, kick-up C-Pillars and floating roof. Eight colors will be available, including Electric Blue Metallic, Monarch Orange Metallic and Scarlet Ember Tintcoat. Inside, the roomy interior also features signature design elements found in Maxima and Altima, including the "Gliding Wing” instrument panel that expands the feel of the space through use of a light and sleek "wingspan.” Nissan says the "horizontal architecture, open spaces and use of harmonious materials and colors add a fresh, up-level quality to the entire cabin. 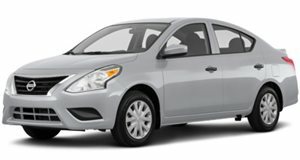 Under the hood, the 2020 Versa gets Nissan’s next-generation 1.6-liter four-cylinder engine producing 122 horsepower and a 114 lb-ft of torque (a slight increase over the previous model, which had 109 hp and 107 lb-ft) paired with an enhanced Xtronic transmission or a five-speed manual. Standard safety features include Automatic Emergency Braking with Pedestrian Detection, Rear Automatic Braking, Lane Departure Warning and High Beam Assist. Other standard tech features often reserved for more expensive segments include remote keyless entry, push-button start and power windows. Popular features like heated front seats, Automatic Climate Control, Apple Car Play and Android Audio are also available. Optional equipment includes Blind Spot Warning, Rear Cross Traffic Alert, Intelligent Driver Alertness and Intelligent Cruise Control. Sales for the 2020 Nissan Versa kick off this summer, with pricing details to be revealed closer to the sale date. The 2019 Nissan Versa starts at just $12,360, but the extra standard tech offered in the new model will likely bump the price up. Even so, it should still be a very affordable subcompact sedan.